I realize that all I talk about right now is Renegade and preparation, and I'm constantly showing off all of my new goodies. Don't worry. I haven't forgotten you. This is a crazy time for me, but I know you can't really help that a lot of you aren't remotely close to me. Sooooo... here is what I would like to do. I would like to have a shop update sometime next week. I will be posting 2 girl deer ornaments, 2 boy deer ornaments, 5 owl ornaments, and 5 penguins. I realize this adds more work to my mix, but I can't expect you to wait until after I come back from Chicago to buy ornaments. I will announce the date and time very soon. If you are able to come out to Renegade, please wait to buy them in person. I would love to be as fair as possible to everyone. A little different, right? Haha. It was a good day (except for all the self doubt, but we'll save that for another day). I'm off to Springfield again tonight to step completely out of my comfort zone, but I'll talk more about that soon. Let's just say I'm more comfortable behind the lens than I am in front of it. I'll leave you with this- a cute family being absolutely adorable. love your new color,as well as Erin's! 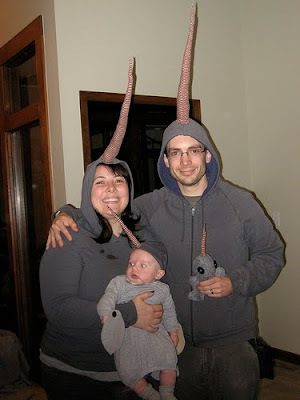 All I see when i look at that family dressed up is penises. Yep. have fun in Springfield! Wish I could come for a visit again... will you be modeling for the new RVA goodies?? Can't wait to see! I'm excited to see how tonight's adventures turn out! :] I wish I could hang out with you, you seem like a bundle of fun. I loooove all of the red hair. Seriously jealous. I love both your and her styles - you two look gorgeous! I miss having red hair. that last picture is pretty much the greatest thing i've ever seen! You are sweet. I am glad we like our hair. I want so badly to come to Renegade to see you and all the other pretties! i need to get an ornament from you... so i can hang it on our charlie brown christmas tree. The Big 500 & Style School!